In the travel industry, the definition of luxury is evolving and shape-shifting. It is no longer about 1000 thread count linens and star chef's (although these are also wonderful). It is about a feeling. An authentic experience enjoyed alongside the like-minded. It is being off-the-grid and the beaten path, unplugging, the road less-travelled, but alongside other interesting people. Achieving this type of luxury, especially when it comes to family-friendly travel, is challenging in a world catering to formulaic, packaged tours and amusement-saturated destinations that tend to be over-crowded and over-priced. After a busy few months our little tribe was craving a getaway, and a tropical climate sounded like just the thing to cure the winter blues, and more importantly, renew our spirits, spark our imaginations and heighten our slightly dulled senses. It takes a special place to tick these last two boxes, especially somewhere that can also cater to our travel needs as parents to two little tykes - also along for the journey. The flights to Managua were eventful (I was covered in vomit from hour two of the first leg). But despite the comedy of errors and a sick baby, we landed in the early afternoon, met by our driver Franklin who whisked us to Granada in his comfortable air-conditioned vehicle. Only an hour from the Aeropuerto Internacional Augusto C. Sandino, this vibrantly-hued, hot and humid town at the foot of Mombacho Volcano, dates back to 1524. It's brightly coloured buildings, tropical climate, cobbled streets and approachable size made it a great base for a few days of relaxing, dining and discovery. We could never have imagined how welcoming Nicaragüenses (and their country) are to families. Almost all the restaurants we dined at in Granada had an inviting kids corner. There were many fellow families, both local and foreign and our boys made fast friends multiple times a day. We would exchange knowing glances with their parents, as if to acknowledge a mutual respect for discovering the beauty and bounty of Nicaragua for families, but also in solidarity for how tired we all felt after attempting to keep up with our children in the heat! While in Granada, be sure to check-in to Los Patios, a true boutique hotel, this design-conscious gem provides guests with the perfect oasis from the colourful, hot and dusty streets. The plunge pool is just the right temperature to refresh, the rooms are spacious and comfortably minimalist and the multiple hammocks, lounge chairs, couches welcome the weary traveler to repose. Family-friendly surroundings meant we met several other parents with young children during our stay. Be sure to request the large quarters looking onto the pool from above with a gorgeous little patio and massive bathroom (cots available). Nicaragua is home to 19 active volcanoes. To our four year old, this information was fantastical. 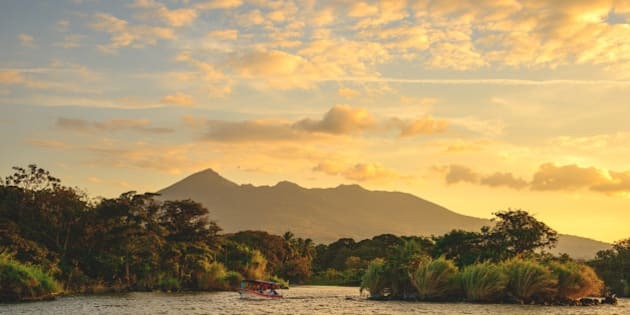 Next trip we will definitely add Ometepe to the itinerary, a beautiful island surrounded by a fresh water lake and home to not one but two volcanoes. A UNESCO world heritage site, we missed out on the reportedly beautiful beaches, archeological treasures, ancient myths and legends, hidden waterfalls and an enigmatic lagoon. But we did get to spend a refreshing afternoon splashing and swimming in the crater of the Apoyo Volcano. We made black sand body masks, ate fresh seafood and beat the intense heat by floating in her turquoise waters. At 200 meters deep this Laguna is the lowest point in Central America. Also just a short drive from Granada is the Masaya Artisan Market. Full of colourful crafts and every manner of jewelry, hand-made straw things, textiles, woven goods, wooden toys and hammocks - truly something for every family member, little and big! The perfect place to do all your souvenir shopping - visit in the morning if possible, before the heat of the day. Another easy field trip from Granada are the Isletas. Located just outside the city centre in lake Nicaragua, 365 islands dot the shore. A Nicaraguan cottage country, many of the wealthy locals and international guests keep their weekend and holiday hideaways here. The formation of islands is a result of a massive Volcano Masaya eruption 1000's of years ago. Fascinating for parents and kids alike, and a relaxing way to spend a morning on the water. Charter a shaded boat around the lake (request an English guide) and stop for lunch at one of the island cafes. Don't miss monkey island so your kids can say hello and feed the little rascals. After a few days as tourists we were ready for some laid back beach time. Only a couple hours by car to San Juan del Sur, but a world away from home. This hot and humid hippie beach town is youthful and fun with a thriving nightlife and lots of hipster restaurants, boutiques and bars. We opted to spend our first four nights in a more remote location about 25 mins outside of town. Tucked in the hills above a trifecta of epic beaches is Hulakai. Part surf retreat, part boutique backpackers lodge, part contemporary b&b, hard to characterize but easy to enjoy. One of the Inn keepers and founders of Hulakai describes it as "a place we always thought and hoped we would find as travelers". 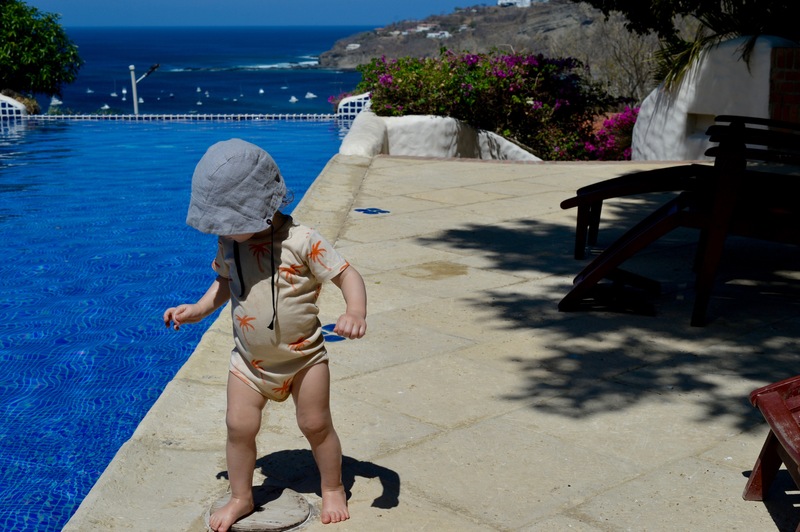 Tyler is a father himself to three young children and beyond his warnings about the tropical creepy-crawlers, strong undertows and the gate-less infinity pool, the hotel is warm and welcoming to families. We spent our days here visiting the rugged beaches in the surrounding area, adventuring into town for ice cream, watching epic sunsets, enjoying family dinners around the long dining table at Hulakai and just generally relaxing. 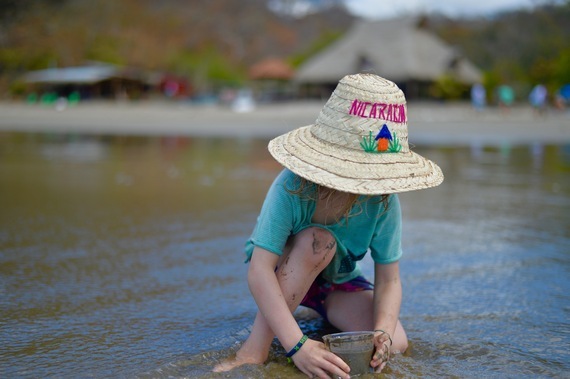 An equally great family-friendly option for lodging is Pelican Eyes, in the hills just above San Juan Del Sur, it's an easy walk into town but has an air of exclusivity thanks to it's perch above it all. Living up to it's name, guests get a beautiful birds-eye view of the cove below. The refreshing infinity pool is where we spent the majority of our mornings and after a siesta we would wander into town for smoothies, sunset beach walks and dinner. Nicaragua is brimming with natural wonders, seeing it through the eyes of our children allowed us to revel in the small nuances and delight in the mundane. We will definitely return again soon, if our boys have anything to say about it! If you are planning a Fall or Winter getaway, be sure to take our advice and see Nicaragua while it is still relatively untouched, you won't regret it!